Did ‘Aaron Burr’ et al. play into Trump’s hands? I like putting “Aaron Burr” in headlines. It lets me pretend that I’m living in times in which “the damn’ fool that shot him” was alive and active in our politics. Not that I like Burr much. But it puts me in a time when our presidential choices were between people like Washington, Adams, Jefferson and Madison (and Burr, who nearly won over Jefferson, but let’s skim over that). Anyway, to follow up on yesterday’s post about the “Hamilton” incident (again, something that sounds like the kind of incident I’d rather be writing about than “Trump” incidents), there’s a growing body of thought out there that the artsy liberal actors played right into the hands of the president-elect. Even that Pence’s presence there may have been a deliberate provocation. And that this sort of thing is likely to happen again and again because, you know, those Eastern cultural elites are just so predictable, and can’t help themselves. Strike them on their emotional patellar tendons, and they jerk. Trump, and only Trump, won this round in the culture wars. And with many more rounds to come, liberals need to find some way not to take his bait. Maybe Pence decided to see the hottest show on Broadway because it’s the hottest show on Broadway. Or because it’s a Pulitzer-Prize-winning work by a bona-fide genius. Or because, with its story of a destitute autodidact pulling himself up by his own bootstraps, it has had documented appeal to Democrats and Republicans alike. But I also wouldn’t be surprised if Pence attended Friday’s performance specifically hoping, or at least expecting, to stoke boos and a brouhaha that would ultimately rouse the Republican base — and distract from much more embarrassing Trump-related news. Think about it. Trump could not have chosen a more perfect cultural foil than “Hamilton” if he’d designed the show himself. The show has — somewhat paradoxically — become an unwitting symbol of out-of-touch, cosmopolitan liberal elites. Tickets to the smash hit can fetch thousands of dollars, making them inaccessible to all but the reasonably wealthy. The show is fawned upon by effete elites such as myself…. 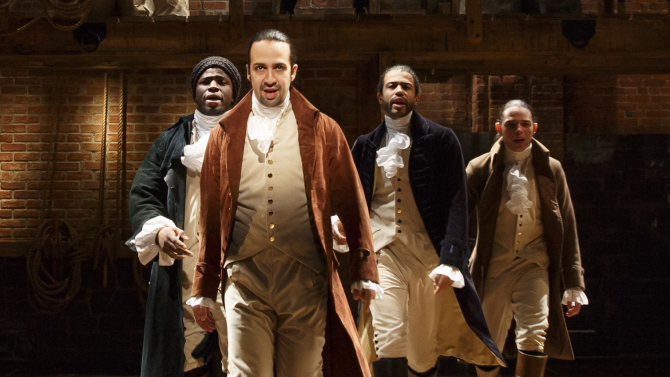 A digression: Actually, I think by casting “people of color” (one of the odder, most stilted, most retrograde-sounding phrases currently approved by those Trump is pleased to bait) in the roles of the Founders, Lin-Manuel Miranda has struck a blow against political correctness. By portraying the folks too many would dismiss as “old, dead white guys” as people of every race and color, he has rescued them from the scorn of the sillier Identity Politicians and shown the universality of their ideas and accomplishments. It sort of says, Shut up about their race and gender and read what they wrote! People in the American heartland see all this, and they shake their heads in disgust. Today’s Democrats have become a party of coastal elites completely disconnected from the rest of America. Doubt it? Take a look at a county-by-county map of the 2016 presidential election. 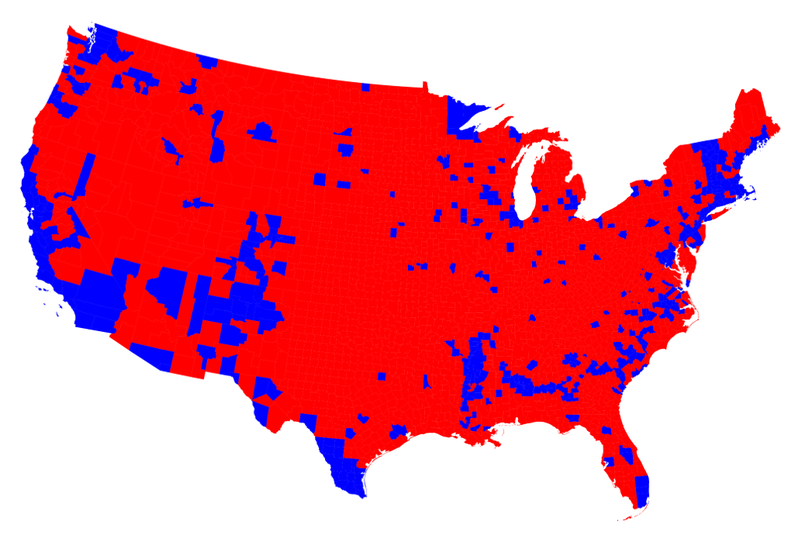 You can drive some 3,000 miles across the entire continental United States — from sea to shining sea — without driving through a single county that voted for Hillary Clinton…. How does ‘One-Note Samba’ work? This entry was posted in Arts, Kulturkampf on November 22, 2016 by Brad Warthen. I feel like I’ve been saying all that for quite a while now. At some schools that require history majors to take at least one U.S. history course, the requirement can be fulfilled with courses like “Mad Men and Mad Women” (Middlebury College), “Hip-Hop, Politics and Youth Culture in America” (University of Connecticut) and “Jews in American Entertainment” (University of Texas at Austin). Constitutional history is an afterthought. One thing I’ll say in defense of those who don’t know that stuff that everyone should know… if you asked me who was in command at Yorktown, I might suspect it was a trick question. I mean, of course Washington was in overall command, and forced to answer that’s what I’d say. But I don’t know that battle well enough to know who had actual tactical, operational command of the troops in that particular place and time. (Of course, the army in those days was a smaller, simpler thing, so I suppose I betray a modern bias in even raising such an objection to the obvious.) Also, wasn’t there coordination with French naval forces, and could Washington be said to have been in command of that element? I don’t know. I think Bryan’s more up on that battle than I am; maybe he can say. Sometimes, too MUCH information can confuse. For instance, I recently read Anthony Beevor’s book on the Bulge, and if you asked me who was in command, I’d say Eisenhower overall, of course — but operationally, it was a little confusing. Most of the troops involved, I believe, was Bradley’s. But Ike sorta gave more immediate control to Montgomery, at least in the battle’s early stages — I think. It was really complicated, and a lot of it had to do with perception as to who had the upper hand at any given moment in the perpetual politics between those people. I’m convinced they gave Trump so much air time because they thought the “average viewer/voter” would see right through his schtik. Instead, it was just free air time. What stuff. The media damned him with everything they reported that he said and did — in the eyes of anyone with a clue. But as y’all know, I worried all along that that was not enough, given the, um, level of perspicacity of much of the electorate. Which is why I kept explaining, and in the view of Doug and some others, hysterically shouting, that THIS IS BAD STUFF!!!! It is beyond clear that Trump is on his way to being, if not the worst President ever, then certainly our next Constitutional crisis. To think otherwise is to engage in magical thinking. Thomas Friedman had an interesting point on NPR this am – the central issue with our society is that a large segment of our society has not realized that it needs to evolve as the world changes. We don’t need to heep derision on their floundering; but that is the basic fact we all face. The world changes and we must change with it. Calling more urbanized citizens cultural elites is just as bad as disparaging the less urbanized. But at the end of the day, many of those blue voters – who won at least one county in every state save Oklahoma – are citizens who are currently finding ways to exist and thrive within today’s world. Not some mythic yesterday’s America – today’s world. It’s an idea much of SC could take to heart. First of all, let’s demolish this crap about how “Hamilton” plays strictly to the “elites” because of its high ticket prices. Yes, it has fetched the highest ticket prices in Broadway history, but that is (and this should make perfect sense to those who worship at the altar of the Holy Church of The Invisible Hand of the Free Market) primarily because of the incredibly high demand. The over-$1000 prices you read about are strictly due to the secondary market. One reason the producers raised the highest ticket prices was to try to cut into what they were losing to scalpers. But lots of $10 tickets are being made available through a lottery. Also, regular ticket prices in not-the-fanciest-sections of the theater were (when you could get them before they sold out) selling in the $150-$180 range. Yeah it’s a lot of money, but how many of these “people from the American heartland” (as they were characterized in one of the quotes you cited above) who scoff at the elites paying $200 for tickets to Hamilton would think nothing of shelling out $150-200 for an NFL game? Or tickets to hear a A-list pop or country music star? You know how much a freakin NASCAR race ticket costs? So it’s not about the money or cost, it’s about cultural hostility, primarily between urban America and suburban/rural America. But that’s me. We raised five children on a newspaper salary, and just when that salary was high enough to give us some breathing room once my kids were out of college, I got laid off (with two left in college). So, “disposable income” has always been something of an alien concept to us. My notion of what things should cost is stuck back in the days before I was a Dad. As I noted the other day, I probably saw that awesome Leon Russell show in Memphis (and Dylan, and The Band, and Elvis, etc.) for about $5 — which is what I still think such things should cost. I’ve seen one Broadway show in my life — and I saw it for free. The SC delegation to the Republican National Convention in 2004 was invited to see “Fiddler on the Roof” starring Alfred Molina as Tevye for free. Since I was covering the delegation and their doings — and since Republicans experiencing a New York that was less than thrilled to have them was part of the story — I tagged along. It was a real bully circus…. there may be bullier circuses than what that one was, but I never struck them yet. Anyways, it was plenty good enough for ME; and wherever I run across it, it can have all of MY custom every time…. Mind you, I’m not advocating sneaking into things without paying. I’m just saying I enjoyed that free show as much as Huck did his.